Some of the most enduringly cool little weirdos ever are the eight pictured above, the Diener Space Creatures. I did a brief post on them in the early days of this site, but figured it was about time I gave them a more in-depth look with better photos. First, a bit of background. 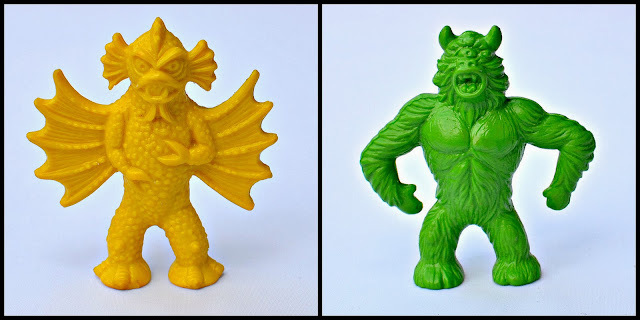 Diener Industries is a company best known for creating a wide range of novelty toy erasers over the years--not just monsters, but animals, cartoon characters, holiday-themed figures and more. I'm actually not sure if they're still in business, but I do know that they produced these kinds of toys for decades, since the 1950s. Their products could be found in many places, from pharmacies to school carnivals to dentists offices. 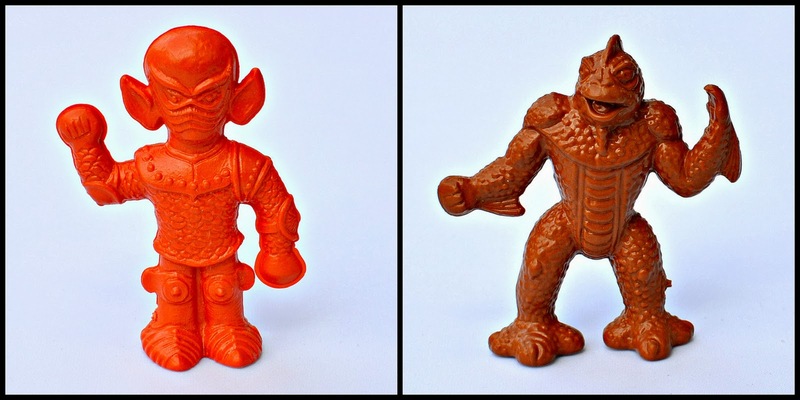 I haven't been able to find an exact year that the Space Creatures made their debut, but they are most often associated with the early 1980s, when they were offered as Happy Meal prizes at McDonalds. It's possible that they first came out sometime in the 1970s, though. They were released in a variety of formats over the years, in different materials. The early releases were produced in a soft rubber material. Later releases (such as the ones shown in these photos) were made of a firmer plastic material. VAMPIRE BAT CREATURE (left) takes inspiration from the Batman comic character Man-Bat. This is one of my favorite Diener figures. I love his surly-looking face, which gives him a lot of character. INSECTMAN (right) is a nod to the '50s movie The Fly. He's a great example of all that's noteworthy about this set, boasting a sculpt that's incredibly clean yet at the same time highly detailed. I'm glad I have him in green, which I think is a natural fit for this figure. TREE TRUNK MONSTER (left) is very much a take on the creature from 1958's I Married A Monster From Outer Space. This is one of the first Diener figures I remember getting as a kid. It was a yellow version in eraser form sold down the stationery aisle at Walgreens. Another one of my favorites. 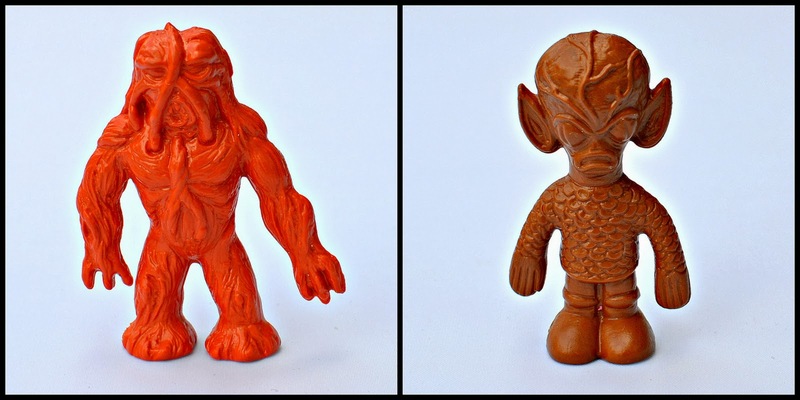 VEINED CRANIUM CREATURE (right) gives us a mini figure version of the classic "little green man," and more specifically, one of the aliens from 1957's Invasion of the Saucer Men. How can you not dig this little dude? He's just too cool. 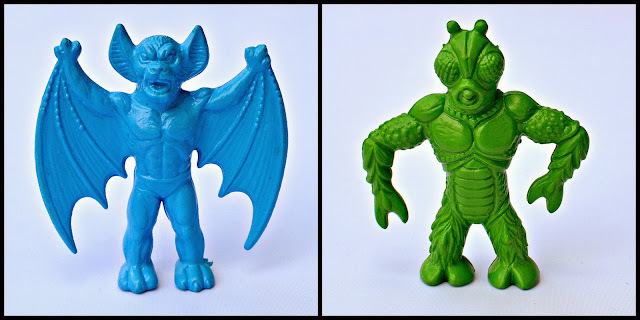 WINGED AMPHIBIAN CREATURE (left) is designed after the monster from the 1966 film Destination Inner Space. Just as with Vampire Bat Creature, the really ornery, detailed face makes this one for me. That and his bumpy body. This is another one I remember getting in eraser form from Walgreens back in the day. HORNED CYCLOPS (right) is the Space Creature that seems to be the least traceable to a specific classic movie/TV monster. He does show similarities to the cyclops by Ray Harryhausen from The 7th Voyage of Sinbad, though. GILL FACE CREATURE (left) is based on Ikar, a character from an episode of The Outer Limits. He's the most robotic-looking of the bunch, at least in body (his face, of course, sports gills). LIZARD MAN (right) is another of my personal favorite Space Creatures, and yet another I recall having as a kid (in blue). I really like his heavily-textured body and hook-like hand/arm. This one was inspired by a Harryhausen creature as well--the Ymir from 1957's 20 Million Miles to Earth. And that's it! I kind of always wished Diener made a second series of these, but then again, who knows if it would have been nearly as awesome as this classic set of eight. What do you think of the Space Creatures? Which ones are your favorites? He definitely has a Swamp Thing look! Thanks for the informative write up on these, its good to know more about them! I like the bat guy and the fly guy the best too, the lizard guy is cool also. Thanks for reading it, glad you liked! Again, thanks for posting! Awesome information! I have a figure I always associated with this set. It's very much like the man bat creature, but with feathered wings and an eagle's head. Darker flat orange. I'll take a picture of it when I'm next at home and post. Are you aware of the Diener Space Raiders that predate this set? Yep! I have a separate post up on those.